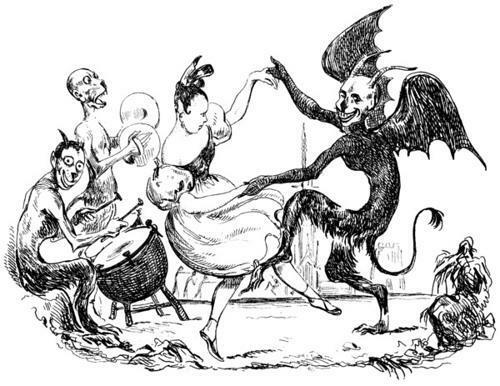 Dancing with the devil. Drawing from Decoded Stuff. our president is waltzing with the devil. When you dance with the devil, never fool yourself into thinking that you're leading. That would be my 50-cents-worth of advice to President Barack Obama as he remakes his presidency into a Clintonesque corporate enterprise. Following last fall's congressional elections, he immediately began blowing kisses to CEOs and big business lobbyists, and he's now filled his White House dance card with them. First came Bill Daley, the Wall Street banker and longtime corporate lobbyist. In early January, Obama brought him to the White House ball to be his chief-of-staff, gatekeeper, and policy coordinator. Then Obama tapped Jeffery Immelt to lead his Council on Jobs and Competitiveness, which is supposed to "encourage the private sector to hire [Americans] and invest in American competitiveness." This is a bizarre coupling, for as General Electric's CEO, Immelt was a leader in shipping American factories and jobs to Asia and elsewhere. Today, fewer than half of GE's workers are in our country. As an AFL-CIO official notes, "Highly globalized companies don't have the same interests as the United States. There is no company more emblematic of this than GE." In his recent State of the Union speech, Obama offered only cold comfort to the millions of Americans who are unemployed or barely employed, saying blandly that "The rules have changed." Well, yes -- and who changed them? Self-serving CEOs like Jeffrey Immelt, that's who. America's working families -- our endangered middle class -- have a right to expect Obama to fight for rules that are fair to them and our country, not meekly accept rules that have been skewed by an elite corporate class to profit them alone. Instead, our president is waltzing with the devil. He's rebranding his presidency, all right. It's becoming Obama, Inc.
[Jim Hightower, a radio commentator, writer, public speaker, and former Texas Agriculture Commissioner, edits the populist newsletter, The Hightower Lowdown. This article was posted to OtherWords and distributed by CommonDreams.